Today our world tour is back on mainland Europe as we head to Germany and the city of Stuttgart. The tram in today’s image is no. 460, a metre gauge Esslingen GT4 which was built in 1961 for use on the traditional Stuttgart tramway. 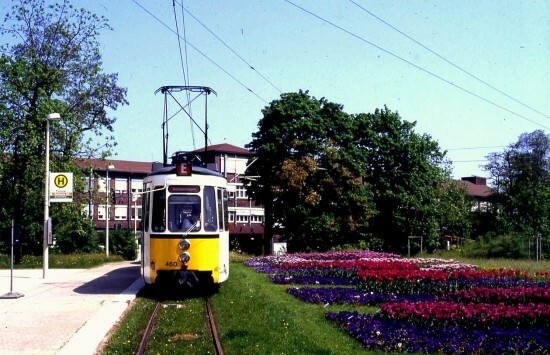 This tramway has been modernised in recent years to offer a modern Stadtbahn system totalling over 81 route miles with the last replacements taking place in late 2007. But at the time of this photo – 1993 – 460 was still operating and is seen here on shuttle service E on temporary Gartenschau track. See Mike Russell’s ‘Classic Trams’ article in the November edition of ‘Tramways and Urban Transit’, which points out that, although the Stadtbahn system you mention is standard gauge, they have retained much metre-gauge track (including mixed gauge sections) for the use of the museum fleet. One of the photos accompanying the article is of GT4s 401 and 471, similar to 460 above, running in multiple in subway at Charlottenplatz. Note that ‘Gartenschau’ is German for ‘Garden Exhibition’ or ‘Festival’, so the last sentence should probably read “…on temporary track at the Gartenschau”. This temporary line ran from the Cannstatter Wasen section which operated on special occasions such as the Cannstatter Volksfest (the Stuttgart equivalent of the Munic Oktoberfest). The tram museum at Zuffenhausen – all metre gauge – was closed when route 15 was converted to standard and the museum trams reclocated to Cannstatt depot with its metre-gauge connecting tracks from which the ‘Oldtimer’ fleet operates over the retained metre-gauge sections.